At some point between now and the July 31st trade deadline, the Yankees are going to trade for a starting pitcher. It is not 100% set in stone, of course, just extremely likely. Jordan Montgomery is done for the season and Masahiro Tanaka will be out several weeks, plus enough physical concerns exit with Tanaka and CC Sabathia that adding depth to get through the 162-game season makes sense. The trade deadline is less than seven weeks away now, and while many players will become available between now and then, we already have an idea who the top trade candidates will be. Cole Hamels, J.A. Happ, Tyson Ross, maybe Michael Fulmer, maybe Chris Archer. There’s a case to be made for acquiring each of those guys and a case to be made for staying away. They’re all should be available though. We’ve been talking about those guys so much that I’m sick of hearing about them. I’m more interested in potential surprise trade candidates. The guys who become available that no one really had on their radar. The Tommy Kahnle pickup, though part of a larger trade, kinda came out of nowhere. Trying to come up with surprise trade candidates is never easy, though after some digging around, I think I’ve identified three possibilities. Let’s get to ’em. Background: The soon-to-be 25-year-old Glasnow is a former top prospect who spent several years in the top 25 of Baseball America’s annual top 100 list. Walks have always been an issue though, and in spot start duty from 2016-17, he had a 6.75 ERA (5.74 FIP) with 19.5% strikeouts and 13.4% walks in 85.1 innings. This season Glasnow has a 4.89 ERA (3.56 FIP) with 29.4% strikeouts, 11.8% walks, and 51.1% grounders in 35 innings, all in long relief. Breakdown: Glasnow is a Yankees-sized pitcher (6-foot-8 and 220 lbs.) and he has simplified things out of the bullpen this year, relying mostly on his mid-to-upper-90s fastball and hard 80-ish mph curveball. During his days as a starter he also threw an upper-80s changeup and tinkered with a slider. Glasnow has shown much better than league average spin rates with his fastball (2,419 rpm vs. 2,263 rpm) and curveball (2,825 rpm vs. 2,507 pm). That is an elite curveball spin rate on par with Justin Verlander’s (2,837 rpm) and Charlie Morton’s (2,931 rpm).
? Reasons To Trade For Him: The raw stuff is excellent — that’s why Glasnow was a top prospect for such a long time — and we’re talking about a 24-year-old kid under team control through 2023. The Yankees love physically huge power pitchers and Glasnow fits that profile perfectly. He misses bats, he gets grounders, and an argument can be made you’d be buying low on him right now. Would the Pirates trade him? Who knows. They haven’t exactly knocked it out of the park with their decision-making lately. Reasons To Stay Away: Glasnow’s mechanics and lack of control are real problems. There’s some Dellin Betances in him. He’s big, his delivery can fall out of whack, and finding the strike zone isn’t always easy. Even during his prospect days, there was some thought Glasnow would fit best in the bullpen, where he could work in shorter stints and not have to worry about repeating his delivery 100 times a game. Those are really the only reasons to stay away. The stuff is good and he’s been healthy throughout his career. The mechanics and control make Glasnow a project, potentially a difficult one. Background: The Blue Jays drafted Hoffman, a semi-local kid from Albany, with the ninth overall pick in the 2014 draft even though he had Tommy John surgery a few weeks earlier. They shipped him to the Rockies as the headliner in the Troy Tulowitzki deal in 2015. 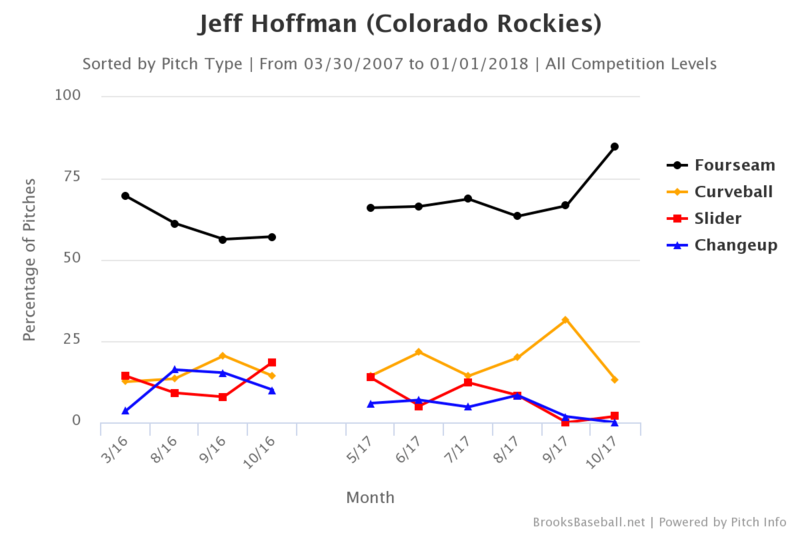 Hoffman, 25, has been an up-and-down spot starter the last few years, pitching to a 5.65 ERA (5.15 FIP) with 17.7% strikeouts and 9.7% walks in 130.2 innings. There is of course some Coors Field stink in there — Hoffman has a career 6.97 ERA (5.41 FIP) at home and 4.04 ERA (4.76 FIP) on the road. Breakdown: Hoffman was not the ninth overall pick despite Tommy John surgery by accident. He’s a power pitcher with a deep arsenal. His fastball sits mid-90s, his slider and changeup are mid-80s offerings, and he has an upper-70s curveball as well. If you’re into such things, the scouting report at FanGraphs says the fastball, slider, and curveball all have above-average potential with the changeup being a potential average fourth pitch. 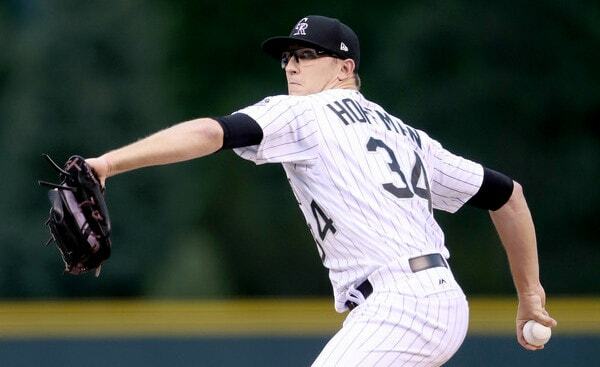 Last season, during his only extended big league stint, Hoffman showed above-average spin rates with his fastball (2,385 rpm vs. 2,263 rpm), his curveball (2,687 rpm vs. 2,507 rpm), and his slider (2,706 rpm vs. 2,398 rpm).
? Reasons To Trade For Him: The Rockies have more quality young pitching right now than they’ve ever had at any point in franchise history. Hoffman has been struck in Triple-A most of the season — he was recently called up for long relief duty — and, to me, he’s a great post-hype target. By that I mean a talented young player who was once a top prospect, but has since kinda faded out of the spotlight. Think the pitcher version of Didi Gregorius or Aaron Hicks. The curveball and slider (and, to a lesser degree, the changeup) are good pitches. Throw them! I know Hoffman throws hard, but approaching 70% fastballs from 2016-17? Seems a little high given his secondary pitches. Maybe that’s a Coors Field thing. The breaking balls didn’t behave properly in the thin mountain air and Hoffman leaned on his fastball. Either way, a 25-year-old with a good four-pitch mix who is under team control through 2023 seems like an obvious trade target to me, assuming the Rockies are actually open to dealing him. Reasons To Stay Away: The Tommy John surgery, for one. There’s an injury history here. The larger flaw is that, even at his best, Hoffman didn’t miss as many bats as the stuff would lead you to believe. Despite a career 27.6% strikeout rate in the minors, his swing-and-miss rate has been consistently in the 9% to 10% range, which is well-below-average for a top pitching prospect. Trading for Hoffman would mean banking on a return to sea level and the anti-fastball lifestyle getting him to miss more bats and maybe get more ground balls too (career 43.8% grounders). Background: At this point Richards is a known commodity. He broke out in 2014, battled injuries from 2016-17, and so far this season he has a 3.26 ERA (3.87 FIP) with 27.1% strikeouts, 11.4% walks, and 50.6% grounders in 66.1 innings. The Yankees have hammered Richards twice this year, scoring 12 runs (eight earned) in four innings in two starts. Against non-Yankees teams, the 30-year-old right-hander has a 2.31 ERA (3.64 FIP) in 62.1 innings this season. Breakdown: Richards truly has top 1% stuff, I believe. He’s upper-90s with his four-seam and two-seam fastballs, right around 90 mph with his slider, and low-80s with his hammer curveball. Among the 101 pitchers to throw at least 1,000 pitches so far this season, Richards has the highest four-seamer spin rate (2,607 rpm), the highest two-seamer spin rate (2,549 rpm), the highest slider spin rate (2,906 rpm), and the highest curveball spin rate (3,245 rpm). Spin rate is not everything. It’s like velocity. It’s one tool in the shed. But holy crap, no pitcher in baseball combines velocity and spin like Richards.
? Reasons To Trade For Him: This seems obvious enough, right? Richards has shown he’s a very good big league pitcher with high-end stuff that produces strikeouts and grounders. He’s a free agent after the season, so this is a rental situation. For Richards to actually become available, the Angels will probably have to fall out of the race before the deadline, which simply might not happen, even with Shohei Ohtani and Andrelton Simmons on the disabled list. The Halos are currently 6.5 games back in the AL West and six games back of the second wildcard spot. To me, they look good enough to hang around the race all season. If they don’t though, Richards may suddenly become a very in-demand trade candidate. Reasons To Stay Away: The lack of success at Yankee Stadium (19 runs in 23 career innings) doesn’t scare me too much because Richards wouldn’t be facing the Yankees at Yankee Stadium anymore. The larger issue here is his injury history, which is ugly. Richards tore the patella tendon in his left knee covering first base in 2014, he tore his elbow ligament in 2016 and managed to avoid Tommy John surgery by rehabbing the ligament with an experimental stem cell procedure, and last season he missed most of the year with a biceps strain. Trade for Richards and you run the risk of him getting hurt and not contributing at all. And maybe that’s a risk worth taking. It’s not like there’s a long-term commitment here. Aside from the injuries, everything else looks pretty good. Richards can bring it. The Yankees should — and will — consider both short and long-term rotation additions at the deadline. If there’s a rental who could help put them over the top this season, great. If there’s someone available will multiple years of control who can help them win now and later, even better. Montgomery will miss most of next season and Sabathia might not be back. There’s no such thing as too much pitching, right? The Yankees have space for rentals like Richards and long-term guys like Glasnow and Hoffman. There are some obvious issues with the three guys in this post. One, Richards might not ever actually become available. And two, are Glasnow and Hoffman guys who could help you win right now? Are they starting postseason games this year? Maybe they could. To me, they seem like future pieces the Yankees would acquire this season, tinker with the rest of the way, then really turn loose next season. They’d join the Justus Sheffield/Jonathan Loaisiga talent pool rather than the Luis Severino/Sonny Gray/Sabathia/Tanaka group. Coming up with under-the-radar trade candidates ain’t easy. Glasnow, Hoffman, and Richards jumped out at me because the stuff is excellent and, in the case of Glasnow and Hoffman, they fit the “buy low on a talented player who is kinda sorta falling out of favor with his current team” mold the Yankees used to get Gregorius and Hicks (and Nathan Eovaldi). I have no doubt surprise trade candidates will begin to surface. Maybe these dudes will be among them. Either way, the Yankees are going to look high and low for another starter before July 31st.